Our first away meet of the season took us across the river for a visit to the Midlothian YMCA. Our hosts were both hospitable and competitive! But halfway through the dual meet season, Ridgetop managed to remain undefeated, winning by a score of 1460-1160. The full results can be found here. Triple-PR swimmers: Maddie Cassidy, Ben Coker, Jack Davis, Tristan Frantz, Owen Prusek, Ellie Grace Robinson, Christian Sleman, Lucie Speck, Millie Speck. The number one goal for the coaches is to see continued improvement in our swimmers’ times, and you did not disappoint! The nine swimmers listed above all set three personal best swims, the maximum possible. Many other swimmers set personal bests in one or more events, and should be very proud of that accomplishment. I know the coaches are!! The single biggest drop of the meet was achieved by Roger Hart, who knocked 23 seconds off his 100 IM time. Wow! Other swimmers who made big drops — 10 seconds or more — were Tristan Frantz, Ariel Ogden, Jackson Oliver, Grace Phaup, Kayla Robertson, Lucie Speck, Millie Speck, Eliza Sundberg, and Madoc Winters. 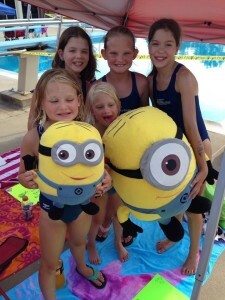 Great job, Riptide swimmers! A number of swimmers improved their JRAC speed classification in one or more events at this meet. Achieving a better speed classification help make the team more competitive in dual meets and and Champs. Great job to all of you! Two new Ridgetop team records were set at the meet! Kate Farmer took the 13-14 100 free record from Zoe Trenz while Taylor Biltz grabbed the 13-14 50 breast record from Emily Pilc. The swims below have made it into the Ridgetop All-Time Top 10 list of fastest swimmers in an age group and event. What an awesome achievement! The coaches very very pleased with the effort, results and sportsmanship displayed at the meet! Butterfly week is challenging to many younger swimmers, who nonetheless worked very hard to get a legal butterfly. It paid off: some of you swam a 50 fly for the very first time, or dropped huge chunks of time in their butterfly event. As a team, we beat a very talented host team while missing around 30 swimmers. Great job, Riptides! Keep it up!